Although all Martial Arts have traditions, have a legacy and have a rich history, no two Martial Arts are alike. There are many aspects of Brazilian Jiu-Jitsu (BJJ) that separate it from the rest. Could it be the fact that it is the most effective martial art when it comes to ground fighting? Or could it be the feeling of belonging to a family? Or could it be the fact that it is a highly effective form of self defense? Or could it be that Brazilian Jiu-Jitsu isn’t just a sport or a Martial art it is a culture or a way of life. 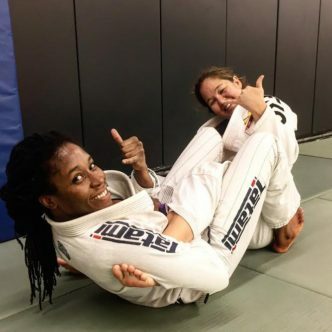 Just as it is important to learn the technique on the mats so is to know the history, traditions and culture. By definition a culture has symbols, language, values and norms. Which BJJ has. We have our own symbols like the triangle, words, hand gestures and we all share core values. We even have our own diet. For instance, how many times have you flashed this gesture in a photo? Do you know what this means? Allow me to introduce you to the shaka! The shaka is a gesture that you do with your hand that consists of extending the thumb and smallest finger while holding the three middle fingers curled, and gesturing in salutation while presenting the front or back of the hand; the hand may be rotated back and forth for emphasis. According to many the origin of the shaka gesture has been credited to Hamana Kalili of Laie Hawaii (June 18, 1882 – December 17, 1958), who lost the three middle fingers of his right hand while working at the Kahuku Sugar Mill. After the accident Kalili was then shifted to guarding the sugar train. His all-clear wave of thumb and pinkie or gesture he used to chase off rowdy kids jumping trains is said to have evolved into the shaka from which children imitated. Another theory is that the shaka sign was introduced by Spanish immigrants that used the gesture of folded their middle fingers and taking their thumbs to their lips in order to offer to a drink with native Hawaiians they met. Shaka and its very positive associations may simply derive from the popular World War II “V for Victory” hand sign, in Hawaii often held up and rotated rapidly back and forth, “shaken”, hence shaka. The late Lippy Espinda, a used car salesman and Oahu-based entertainer, has also been named as a possible creator of the shaka. Espinda, who frequently appeared as an extra in Hawaii Five-O as well as the The Brady Bunch episodes shot in Hawaii, used the term and the sign during his television ads in the ’60s. Though the claim that he is the originator of the shaka sign is debatable, he is credited with increasing its popularity and of Hawaiian Pidgin as well. 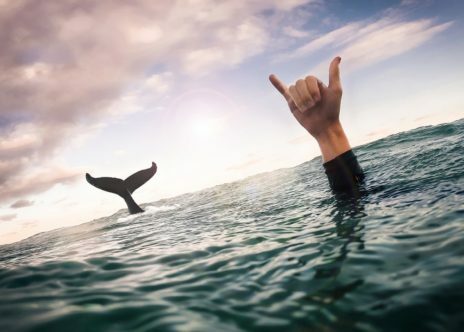 Hawaiians use the shaka to convey the “Aloha Spirit”, a concept of friendship, understanding, compassion, and solidarity among the various ethnic cultures that reside in Hawaii, lacking a direct semantic to literal translation. 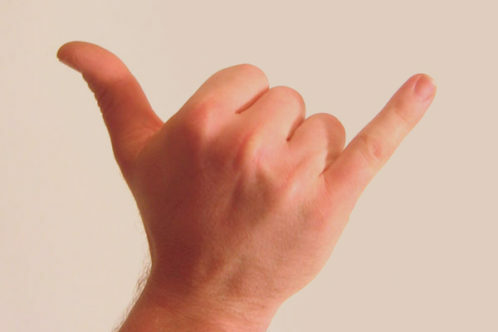 The shaka can also be used to express “howzit?”, “thanks, eh?”, “all right!”, “Hi,”, “See You,” “Peace,” “Goodbye,” “Take Care,”,”Chill Out” and “Hange loose”. Drivers will often use it on the road to communicate distant greetings and gratitude. 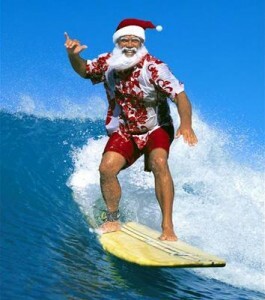 In California, the shaka sign may be referred to as “hang loose” or “hang ten”—both associated with surfer culture. The sign can also be used to indicate the imbibing of a bottled drink, as attested to below, by placing the thumb to the mouth and motioning the little finger upward as if tipping up a bottle’s bottom end. A similar meaning can be achieved by pressing the thumb up against the tip of the nose with the little finger raised upwards parallel to the bridge of the nose. Referred to as “schooies” (Australian slang for a schooner) the sign is thought to have originated in Perth. With the thumb held near the ear and the little finger pointed at the mouth, the gesture is commonly understood to mean “call me”, as it resembles a hand held telephone. With the fingers facing forward, the same gesture is the letter Y in the American manual alphabet. See also ILY sign. In the Caribbean, particularly the Lesser Antilles Aruba, Bonaire and Curaçao, it may be used to suggest a sexual exchange; for such, the thumb points to the one making the gesture and the little finger toward the one being propositioned as the hand is moved forward and back. In China, this gesture means “6”. In Australia and Russia raising the thumb to the mouth while pointing the pinky to the air is seen as invitation for one to smoke marijuana, the posture resembling the use of a pipe. Similarly in New Zealand, this gesture symbolizes smoking a “P” (methamphetamine) pipe, as well as variations of the shaka sign being the recognized gang salute for the Mongrel Mob. So when you pose for your next photo in your gi and you want flash the shaka sign you better make sure you are doing it right or you might just get more than you bargained for. Now you may be wondering, how did the shaka sign make it’s way from the tiny Hawaiian islands in the middle Pacific all the way to Brazil? By way of sea. How else! 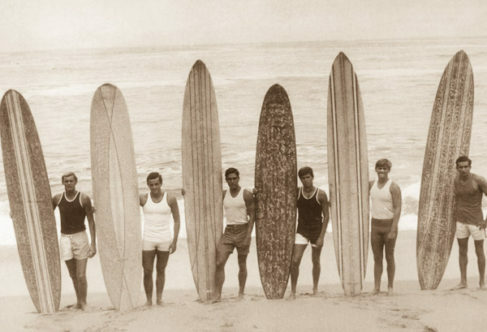 When the surf culture grew and spread through California and America, during the sunny 1960’s, a new body gesture was gaining enthusiasts. Surfers from Hawaii started saluting fellow riders and friends with the shaka sign. Australian surfer Peter Troy gave a demonstration in Rio de Janeiro in 1964. Allegedly the first introduction Brazilians had to surfing. By the 1970s and ’80s, surfing became more widespread among Brazilians. 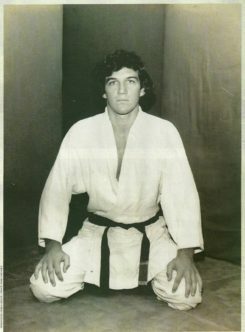 Rolls Gracie, son of Gracie Jiu Jitsu founder Carlos Gracie was the first member of the Gracie family to buy a surf board. Rolls was credited as being the the innovator who was the first of the Gracie’s to actively seek competitions in Freestyle Wrestling, Greco Roman and Sambo wrestling as well as Judo. He was the first to cross train between martial arts. He trained with Osvaldo Alves, with the Judoka in Brazil, and 5 time US Wrestling champ Bob Anderson to improve his grappling stand up. Rolls also trained Olympic Gymnastics and Surfing in order to improve his athleticism. Rolls became involved in surfing in a rather amusing way. Supposedly when one of Rolls Gracie’s students named Mario Gomes (a huge soap opera star in the 1980’s) was surfing on the famous Arpoador beach Mario got into a scuffle with a well known surfer named Daniel Sabbá and was sent out of the beach. This infuriated Mario who then went to Rolls’ academy, where he trained at and told the story to his master. Rolls along with a few of his students decided to confront the bully. Upon his arrival a big fight broke out. However the fight was short lived and in just a few minutes all the surfers were choked to sleep on the beach. The surfers were so impressed that several of the surfers became students of Rolls just a few weeks later. Brazilian Jiu-Jitsu is the fastest growing martial art, but you have to wonder at what cost will this growth come. Will the many traditions and tales of the rich history of Brazilian Jiu-Jitsu be lost with the mainstreaming of BJJ? Will the legacy of the Gracies continue to pass on as it has from one generation to the next? It is all of our responsibilities to make sure this happens. We may no longer be that small community one day, but we can do our best to pass on the traditions and history of our culture.